Arthur Buckley - by Theo. Bamberg "Okito"
Double Daring - Frederick M. Shields & Bascom Jones, Jr. So. Calif. Assembly #22 of S.A.M. Donald Duck's Drinks - A New Routine and Presentation for Taylor's Prize Winning "Por-Mor" - Sherman Ripley "Dr. Chang"
The Answer - to last month's question: What Can be Done to Saver Magic from Oblivion? Slight of Eve - Poem - I.B. 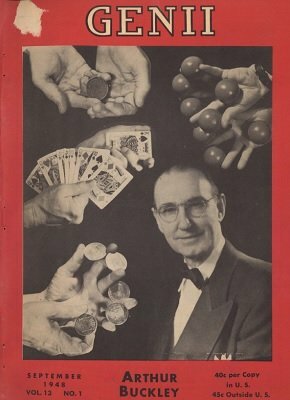 Notice - Bill Larsen - recommends Tannen's "Supersonic Card Prediction"
Triks, five issues, Oct. to Feb.
Cover - Tommy Windsor "The Street Faker"
Cobwebs and Shadows - Bascom Jones Jr.
Dr. Strange Explanation - Bascom Jones Jr.
Cover - Gerald Kosky as "Mister Oso"
Magical Reviews - clipped by "Fletcher"
Kim Yen Soo & Co.